A kitchen is a place where you cannot compromise with the hygiene. Whether it is countertop, cabinet or flooring, everything needs to be clean and tidy. Make your kitchen even more pleasant and enjoy your cooking time with choosing the best floor tiles matching your interior design. The biggest question is which floor tiles are the best for your kitchen. There is no shortage of material with several designs, colors and textures to choose from. 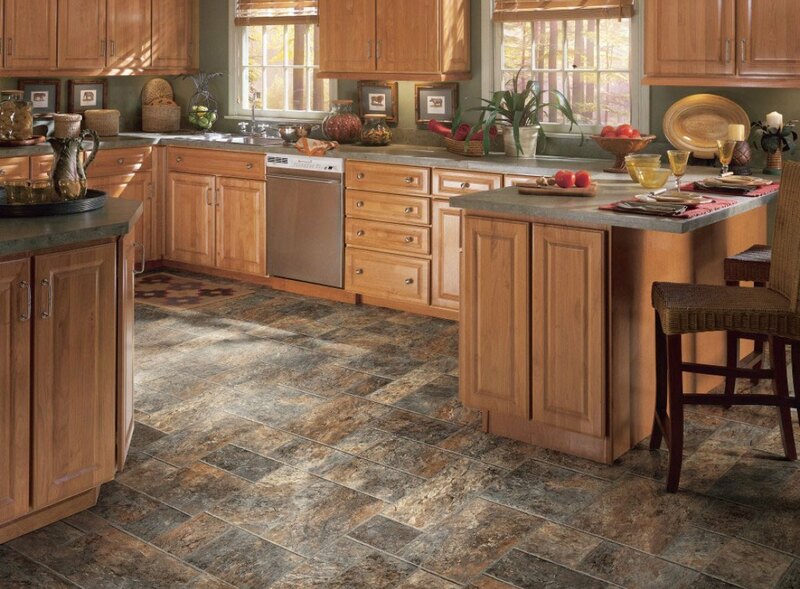 Kitchen floor tiles need to be chosen wisely because the kitchen is the busiest place of the home. Tile Hardness: Hardness measures the ability to handle the foot traffic and scratches. For this, understand the PEI Scale. This scale is used to help standard customers determine the tile hardness and decide which tile they should buy for their different area. From the above scale, Floor tiles best fit for kitchen falls under Class ?. Now, as you are aware of the tile hardness, next you should look at tile porosity. Impervious (Extreme density): 0.5% or less water absorption rate. Recommended for use in the kitchen and bathroom. 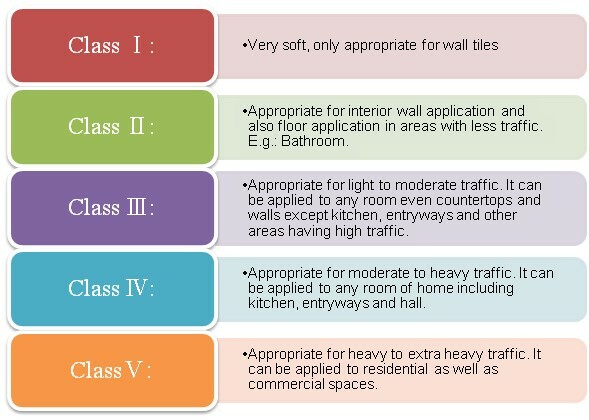 Semi-Vitreous (Medium density): Between 3 – 7 % water absorption tendency. Non-Vitreous (Low density): More than 7% water absorption tendency. This is not feasible for floor tiles. It is believed that ceramic tiles have a high absorbent rate compared to porcelain tiles. Glazed ceramic flooring tiles are ideal for kitchen or bathrooms because they have a protective layer overlaid on the material, making them impervious to water and stain penetration. Ceramic tiles are durable: They are extremely tough and difficult to crack. It is believed that ceramic tiles have a long life of 10 - 20 years and even more if it is well maintained. Even if a single tile cracks, the process of replacing tiles is also easier. Ceramic tiles are easy to maintain: Ceramic floor tiles are easy to clean dirt, stains or wetness on the floor, allowing you to easily wipe them away without the fear of damaging the material. Ceramic tiles are allergen concerns: Ceramic floor tiles have hard and solid surface does not attract dirt, germs, dust or other allergens. Small dust particles are easily recognizable over the surface which makes it easy to wipe them away, keeping the atmosphere clean and hygienic. Each type of tile offers different features and ceramic tiles are one of them. To understand in detail about ceramic tiles and which type of tile is best according to your needs, contact our experts at visit our Inquiry us Page.